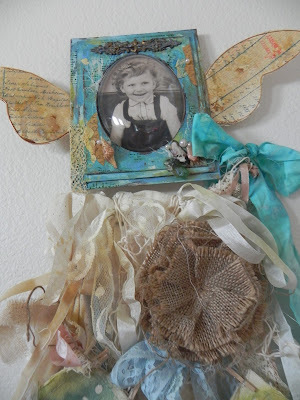 SweetStamps BLOG: Bubble frames wing their way to California! Cheryl Waters, a regularly published mixed media artist living in Southern California, loves being a lead/founding Fiskateer (crafting ambassador for Fiskars). She creates for different companies as a guest designer and shares her work with Stampington and Company's many publications. The crafting community is precious to her and she enjoys all the friendships surrounding art. Cheryl is teaching during the 3rd Annual Seaside Soiree which will benefit Charity Wings and Scripps Institution of Oceanography set for Nov. 30 through Dec. 2 in La Jolla, California. Globecraft & Piccolo have donated 40 of our Classic Traditional Rectangle Bubble Frames that she will use in class to create this vintage seaside wall hanging. The piece is unique in that it also will include use of a Vintage apron and utilize some wonderful mediums to form a timeless piece. See more of Cheryl's work on her site: Artsy Findings. Love the colors in this project. Great idea for a wall hanging!